Marriage is an adventure of its own, but Christoph Kaiser and Shauna Thibault wanted more. The architect and stylist converted a 366-square-foot grain silo into their first home, leading them to pare down and simplify their urban Phoenix lifestyle. 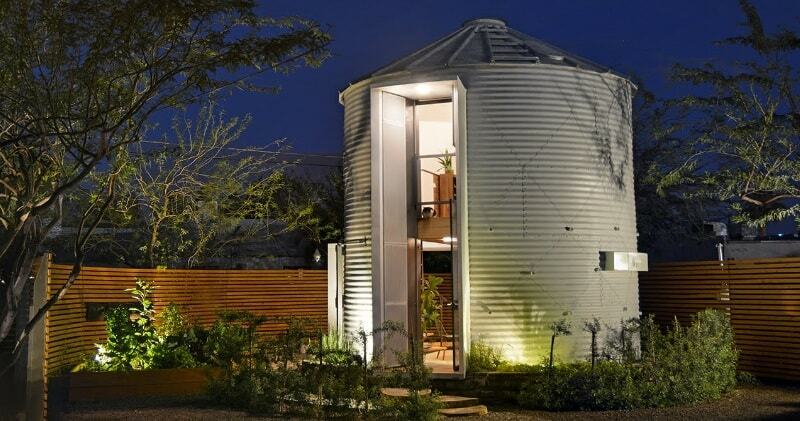 It took over 18 months for the couple to complete the project, with much of the cabinetry and furnishings being constructed by Kaiser himself, in order to fit the round shape of the silo. The space is mostly open, except for a bathroom enclosed behind a cabinet door, so a sleeping loft was added above to add some privacy. The loft doubles as a personal IMAX cinema, with speakers hidden under the bed to deliver that extra bit of sonic theatricality. Interestingly, Thibault notes that sleeping in a round space feels somehow more restful and safe than in a square space. On the first floor is the kitchen and dining area, and upstairs is an inviting sleeping loft. The happy couple was even able to have twelve people over for a holiday dinner and said that hosting them was no problem.So far they love the tiny life, complete with an outdoor shower, spiral staircase and large kitchen table for entertaining.